Welcome to the kick off of what I think is going to be one of the best series of blog posts we’ve ever done on Christian Web Trends, a series on leadership in communications. You know you need a new website, but the board won’t approve it. You know you need to optimize your website, but you don’t have the budget for it. You know you need to update your website and social media consistently to be effective, but you just don’t have the time. You know you need to get started in social media with Facebook, Twitter, or YouTube, but your boss just doesn’t see the value in it. If you face any of those challenges in your organization, be sure to check back daily as we discuss the importance of leadership in overcoming them. Think of a time when you faced a significant communications challenge which you overcame with good leadership. Can you share that story in a comment? What is your greatest communications challenge right now? To what extend do you think good leadership is needed to overcome it? Thanks for getting the discussion started with your comment. 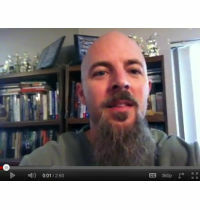 And let me know what you think of the video blog. 1) I can't think of a challenge but I felt like I used some influence to help move our church forward with our social media platform. It wasn't much, and I wan't in a leadership position, but I feel like I helped get us there. 2) Current Challenge: unifying communications church wide and helping to adopt a simple communications mindset. How can I help our church communicate in a way that creates influence in community instead of just spitting out info on events and church happening. Thanks Adam. Regarding #1, way to go – that is leadership! One of the things I want to discuss in this series is that leadership is much more than just using a position of authority to get the people "below" you to do what you ask them to do. Unless you're the top dog in your organization, nfluencing decision makers above you and your peers is critically necessary to great communication. Regarding #2 – that's a big challenge. Glad to hear you're taking it on. That's great Vicki. Thanks for sharing this. You were clearly very strategic – having monthly, weekly, and daily posts. That makes all the difference! Most communication tools (including FB pages) fail because people set them up with no strategy or plan for how they're going to use them. My next challenge is to come up with a communication plan for the church that isn't limited to cut and paste… literally … with scissors and glue… THe average age at our church is over 60 so I am finding it a challenge. I have already developed a website and I am the person that keeps it up to date. The pastor gives me what he wants to post for the sermons etc. I have set the rule that I will only post what is given to me computer ready… I have had several people try to hand me thier video camera to post on the site.. NOPE… i enjoy doing God's work to get the word out to whom ever I can… this is one of the talents he gave me… I am working on getting the church to not be an anchor in this ministry… God did not give me the talent of changing their minds **smile** but he does give me resources such as I am hoping ths site will be .